For a scent and sound sensation that you won’t forget, plug in now and listen to Daniel Sonabend’s curated album. So we’ve heard of the trinity, of three elements that when united form an entity of magnificence. Maybe it’s from the Christian ideology of the Father, Son and The Holy Spirit, or perhaps you’ve heard of the 3 star-alignment of Orion’s Belt. But what about the harmonisation of scent, art and music? Can they not be considered a trinity of perfection that creates an art form in itself? Did you hear the perfumer’s organ which synchronises 200 optical prisms to 200 sounds? The melody of rich heady woody textures and the short and soft floral top notes that smells just as magical in Perfume No.1 Chypre. Well best believe that Daniel Sonabend, the iconic London-based musical composer and producer who specialises in creating music for scents, in collaboration with Jason Bruges Studio, have married the two mediums of olfactory and sensorial art to create an all-encompassing perfume installation through sound called Scent Constellation. As each raw ingredient with their unique characteristics and textures is used, Daniel Sonabend has curated 5 musical fragrances that are a soundscape – almost as love letters to the scent families, with their various sharp, sweet, soft, rich and heavy attributes. The length in which the materials can be heard also depends on the volatility, stability and longevity of the fragrance. Base notes will be heard for the longest but will also come to life after a couple of hours of wearing the perfume, whilst the top notes will not only play for the shortest time but is reminiscent of the of the way it evaporates quickly too! By now you’ve already heard Perfume No.1 Chypre and Perfume No.2 Eau de Cologne, and is probably mid way through Perfume No.3 Fougère. But did you hear the top notes evaporating with haste? Can you smell the low concentration of essential oil fragrances that are as short as the song itself as well as the prevailing scent of alcohol? As the base notes are heard, do you smell citrus and herb tones as per an Eau de Cologne fragrance? Hear and see the differences with No.3 Fougère? JBS ScentConstellation from Jason Bruges on Vimeo. 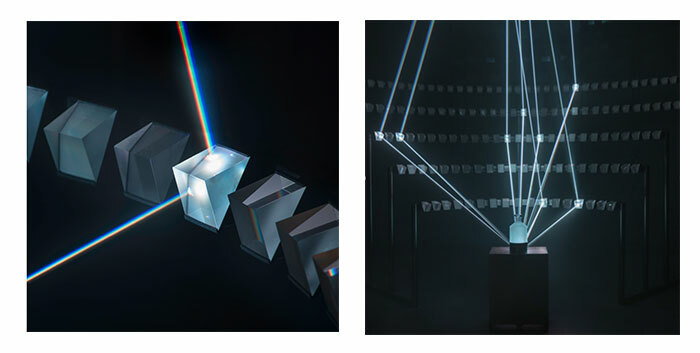 Notice the refractions of light on the prisms that correlate to the 200 sounds being produced, and starting off much stronger than Perfume No.2, contrasting Eau de Cologne’s long fade to end the song, the difference becomes more transparent considering the scent was originally meant to be a fragrance for women. Perfume No. 3 Fougère’s strong yet subtle sound perfectly parallels the blends of flowers and other woodland fauna that is now commonly known as a timeless and refined scent for men, incorporating a mixture of lavender, geranium, bergamot or even coumarin in the perfumes’ blend. But if you thought a fragrance could not incorporate more floral materials, Perfume No.4 Floral uses just as much flowery material in its blend for that soft and more feminine-like fragrance. You can definitely hear the sweet and light multitude of floral top notes within the first 10 seconds as you spray the perfume on for the first time. It’s almost romantic the way the top notes fade into the mid and base notes that become more prominent, but as if it were blossoming as bright and magnificent the longer the fragrance is worn and heard. To finish off, Perfume No.5 Oriental with the hints of warmth and sensuality, hearing the way it beguiles your fondest and most nostalgic memories, formulating the imagery as if you yourself had ventured and explored to the Orient in search for this wonderous fragrance at the dawn of the perfumes’ discovery. The complexities of the various spices and incenses in the fragrance’s blend is rich and heavy in sound that is also a bold and seductive for any wearer be it male or female. In order to immerse yourself in Daniel Sonabend and Jason Burges Studio’s perfume, sound and art trinity that is Scent Constellation’s sensorial installation and hear the symphonies that trigger laser beams onto the prisms which in turn will illuminate the glass centrepiece of the bottled masterpiece of olfactory. This trinity of a “poetic audio-visual metaphor” is on permanent display at the Grand Musèe du Parfum in Paris.